Goku Black’s identity has been revealed as Zamas, the lord of lords from Universe 10! But he’s not alone—his counterpart from the parallel universe has teamed up with him and, thanks to the super Dragon Balls, they are nearly unstoppable! In the present, Goku trains with Master Roshi to perfect the Mafuba and seal Zamas away. Meanwhile, Kaiô-shin takes Lord Gowas, Zamas’s mentor, to the parallel universe to try and push his former pupil back to being good! Goku's adventure from the best-selling classic manga Dragon Ball continues in this new series written by Akira Toriyama himself! Ever since Goku became Earth's greatest hero and gathered the seven Dragon Balls to defeat the evil Boo, his life on Earth has grown a little dull. 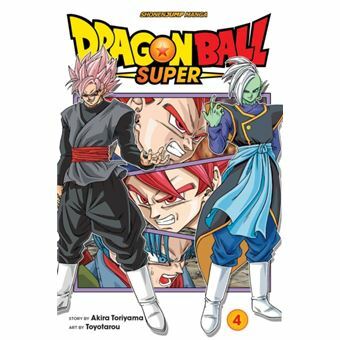 But new threats loom overhead, and Goku and his friends will have to defend the planet once again in this continuation of Akira Toriyama's best-selling series, Dragon Ball! Goku Black's identity has been revealed as Zamas, the lord of lords from Universe 10! But he's not alone-his counterpart from the parallel universe has teamed up with him and, thanks to the super Dragon Balls, they are nearly unstoppable! In the present, Goku trains with Master Roshi to perfect the Mafuba and seal Zamas away. Meanwhile, Kaio-shin takes Lord Gowas, Zamas's mentor, to the parallel universe to try and push his former pupil back to being good!